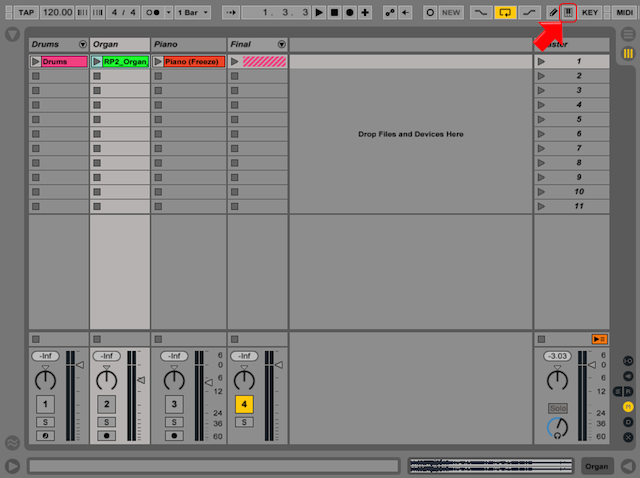 In this Ableton Live Tutorial, Dubspot Contributor and Ableton Live Certified Trainer Josh Spoon shows us how to use Live’s versatile Frequency Shifter effect to enhance sounds. Included is a FREE Ableton Live project to follow along with. When hearing Ableton Live’s Frequency Shifter effect, you may think space music from Doctor Who, Forbidden Planet or any sci-fi movie from the 1950s. This often overlooked device is an audio Swiss Army Knife that can be deployed to create some interesting effects to your sounds. 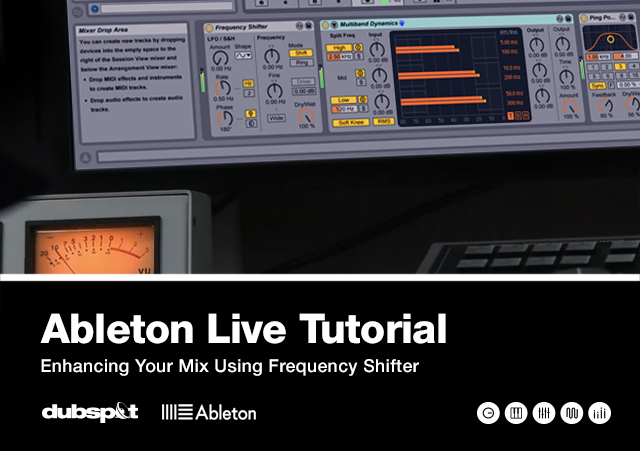 Let’s explore Live’s Frequency Shifter closer! The Frequency section has two modes: Shift and Ring. The Shift control is where we spend most of our time. Frequency Shifter works by shifting the Hz (Hertz) of the incoming signal either up or down using the Frequency, Coarse, and Fine controls. So if your synth is playing a C3 (130.81 Hz) and your frequency is 10 Hz, the result will be 140.81 Hz. Ring Mode controls the frequency that can be either added and subtracted from the input signal. For example, if the incoming audio signal (A) is a sine wave at 440 Hz and the Frequency is set to 100 Hz (B), the output will contain partials at 340 Hz (A-B) and 540 Hz (A+B). The Frequency Shifter is built with two LFOs that can be used to modulate both left and right channels independently. It also has six waveforms to choose from for modulation. You can set the LFO rate with Hertz or sync to tempo. The Phase and Spin controls are great for stereo modulation. In the downloaded project, let’s listen to the final mix with a Frequency Shifter loaded on all the tracks in the Group named “Final.” Press the letter “a” on you keyboard to toggle between the enhanced mix and the original mix. Here is the original mix. Note: Make sure Live’s Computer MIDI Keyboard switch is turned off to access the keyboard toggle. 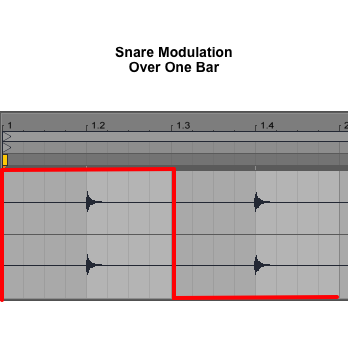 Frequency Shifter is a great tool for enhancing drums. It can be used to modulate the pitch of a few elements of the drums to make them stand out and give them some character. If you try to create this same effect manually, you would probably need to create multiple drum elements and/or open the Clip Envelopes and draw in your modulation. This excludes using the power of Live’s Simper and Sampler, though I’d argue that using Frequency Shifter is best for situations like this because it’s not bound to any sound and can be dropped anywhere in your live set. Before applying the Frequency Shifter effect, let’s first listen to just the drums. We can hear on this basic 808 beat that the low end is present and the snare and hat groove is nice but doesn’t grab our ear with excitement. Let’s enhance this loop a bit by dragging a Frequency Shifter onto each drum cell with a sound loaded and using the effect creatively for each individual element. 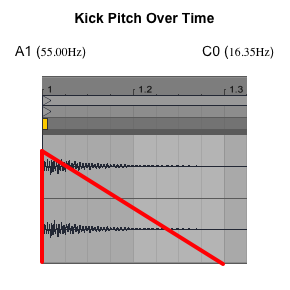 When the kick hits on the downbeat of one and three, Frequency Shifter modulates the kick from about A1 to C0 in two beats. When the kick hits between beats one and three you get different modulations depending on where the downward slope is of the Sawtooth wave at that time. It makes for an interesting enhancement to your kick. Listening to the snare, we can hear only one timbre. The same snare sound occurs no matter if we raise or lower the volume. It’s like no effort was put in to the back beat. When you create music you want to invoke emotion in the listener and you can’t do that with robotic tones. Now, if we play the beat you can hear that the snare sound hitting on the two and four beat is different. That’s because the Square wave is shifting up for two beats and then down for two beats. The first snare falls on the up and the second on the down. It’s a subtle change in pitch that sits well in the mix. If we solo the open and closed hats, we’ll here relatively mono 808 hats. These actually sounds a little funkier then the other elements of the rack, but we can give it more space and have them dance to the groove with a few simple tweaks to the Frequency Shifters in each drum cell. Wide and Spread are our friend again. If you slowly turn the control, you will hear the organ start to open up and sing like you are at a gospel church. For the piano sound, we want to create both more vibrato and more tremolo to create a vibey but slightly dark sound. Applying Spread combined with Ring Modulation and then parallel mixing the effect with the Mix control will help with this approach. We haven’t talked about the Mix control at all because up until now it’s been set at 100% for everything. This knob is very useful, but you need to be careful. I find often settings from about 4-99% is distracting (if other settings are high) in most cases and tends to sound more sci-fi. However, I encourage you to experiment with the different settings, you may find a gem. We added movement to the drums, width to the organ, and tremolo and vibrato to the piano. Going between the original mix and the final mix you can see how much life was added using just a Frequency Shifter. Hopefully you will look at this Audio Effect in a different light. 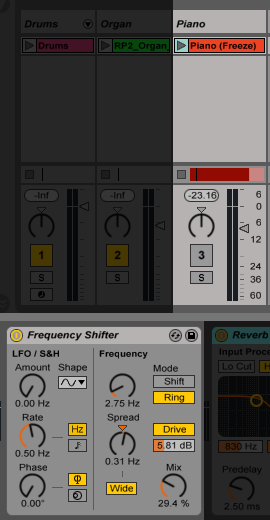 As always open up the Live Set, begin to play and see what you can create with Frequency Shifter. Dubspot blogger Josh Spoon is an Ableton Live veteran, blogger, drummer, music producer, and live performer. Josh has a residency with the eclectic Los Angeles electronic music collective Space Circus, performing every first Friday of the month.